Living Dead Dolls San Diego Comic-Con 2011 Exclusive! Limited edition Sadie Doll celebrates 13 years of Living Dead Dolls! Measures 10-inches tall and comes in a special 13th anniversary coffin. Living Dead Dolls San Diego Comic-Con 2011 Exclusive! Sadie has risen from her grave, ready to celebrate the big 13th anniversary of Living Dead Dolls. She's the first Living Dead Doll to join the festivities, and she arrives all decked out in a black-and-white party dress and party hat. 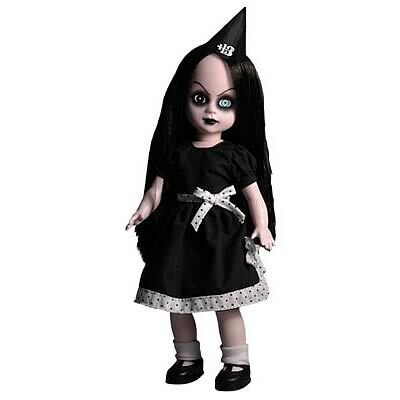 This non-numbered limited edition Sadie Doll measures about 10-inches tall and comes in a special 13th anniversary coffin.